Stunning dinosaur bone wedding band or engagement ring with a princess cut white sapphire center set in sterling silver. 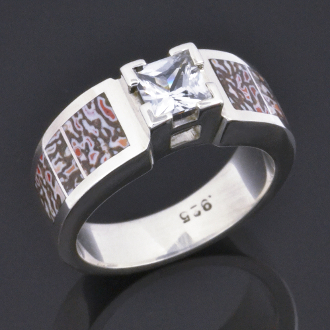 Each side of this handmade engagement ring is inlaid with three pieces of fossilized dinosaur bone. The dinosaur bone in this ring is a white-gray base color with black webbing and some reddish-orange colored cells mixed in. Other bone colors are available. The center gemstone is a princess cut white sapphire weighing .75 carats held securely in the mounting by 4 corner prongs. The ring measures 7.5mm wide at the top and tapers to 4.5mm at the bottom. This ring would make a great wedding or engagement ring for someone looking for a unique and affordable alternative to a traditional diamond ring. A matching wedding band (style W134) could be made with matching dinosaur bone to complete the bridal set. The matching wedding band (not shown) measures 4.5mm wide with a very slight taper to the bottom. The engagement/wedding ring shown in the photo is a size 6 3/4 for scale but will be made to order in your ring size in 4 to 6 weeks. This ring is also available with other inlay materials and other center stone choices. Contact me with special requests or for more details and price quotes. Please add your due date in the special instructions box at checkout. This ring is also available with a moissanite center stone. Check the box if you want to substitute a moissanite for the white sapphire. The last photo is an example of the gray dinosaur bone that is available.